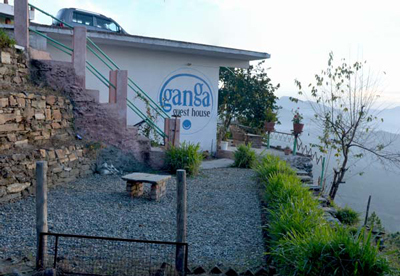 Ganga Guest House is family-run and surrounded by beautiful flora and fauna in the idyllic village of Kasar Devi above Almora, Uttarakhand. As one walks over the picturesque ridge, the breathtaking sight of the majestic Himalayas comes into view. 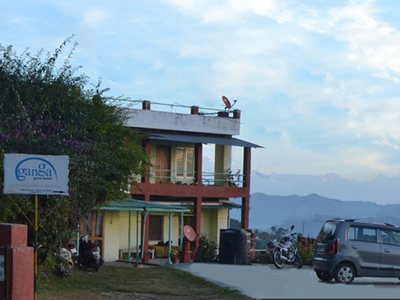 Various snow peaks of India, Tibet and Nepal can be seen from this vantage point, and there is a brilliant panoramic Himalayan view from the accommodation at Ganga Guest House. Our guesthouse is an ideal location for meditators, yogis, artists, birdwatchers and all other guests who appreciate the serenity of nature. It’s also perfect for a romantic weekend getaway or as an escape from hectic city life. There are local tourist attractions in close proximity to the guesthouse, including the popular Eco Park and Binsar Sanctuary, which offers superb forest trekking in absolute tranquility. 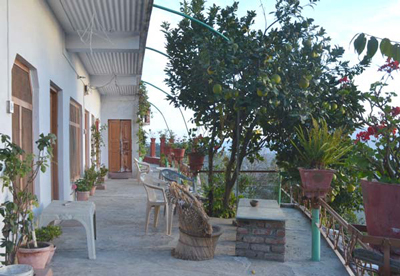 As such, our guesthouse can be enjoyed by tourists, couples, families, and professionals. We offer our guests impeccable service as well as plenty of personal space and privacy. Our rooms are spacious and neatly designed, mindful of your needs from hosting travelers from around the world. A kitchen is available to be used by guests, and home-cooked food using organic ingredients from our garden can be ordered. Broadband internet and fast WiFi is available to guests free of charge, and we are continually improving and beautifying our facilities and amenities.